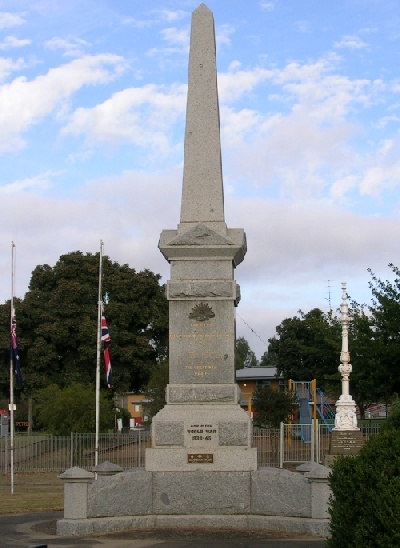 The following names are those listed on the Casterton War Memorial in south-west Victoria, Australia as having lost their lives in World War 1. The additional information column is from attempts to identify the individuals named on the Memorial. Additional information or corrections are welcome. + BAILEY, C Charles Henry BAILEY, b. 1887, Harrow, Victoria, son of William Henry BAILEY and Mary Agatha HOWELL. Pte 2563A, 7th Battalion, AIF, enlisted 23-07-1915, KIA France 25-07-1916. + BAUGH, E Edgar Arthur BAUGH, b. 1895, Killara, near Casterton, Victoria, son of John Andrew BAUGH and Elizabeth GALPIN. He enrolled at Bahgallah School in 1901 with his father John recorded as a labourer of Killara, near Bahgallah. He enlisted in the AIF on 20 Mar 1916 at Casterton and embarked from Melbourne on 27 May 1916. He arrived in France on 23 Nov 1916 and served as Pte 1239, 39th Battalion, AIF. He was gassed on 7 Jun 1917 from which he recovered, but was KIA at Ypres, Belgium on 4 Oct 1917. Unknown grave. + BEDDELL, G George Alfred BEDDELL, b. 1888, Sandford, Victoria, son of Richard Henry BEDDELL 1856-1938 and Catherine WILSON 1863-1891. George enlisted 22 May 1916 at Hamilton, Victoria as Pte 6619, 7th Battalion, AIF, and embarked from Melbourne on 2 Oct 1916 with the 21st Reinforcements for the 7th Battalion, AIF. He arrived in France on 20 Apr 1917 and was KIA on 4 Oct 1917, Broodseinde Ridge, Belgium. Unknown grave. Bahgallah Old Scholars & District Volunteers Honour Roll ? + BLACK, G A Gordon Alexander BLACK, b. 1890, Casterton, son of John William BLACK and Louisa SEALEY. Pte 1235, 39th Battalion, AIF, enlisted 25-03-1916, KIA Belgium 4-10-1917. + BOYD, J C John Campbell BOYD, b. 1882 Wedderburn, Victoria, son of John Cunningham BOYD and Elizabeth Gray PATTERSON. He married Agnes Maud TAIT in 1905 and had a number of children born in Merino or Casterton before 1915. Pte 2041, 39th Battalion, AIF, enlisted Casterton 7-06-1916, KIA, Belgium 12-10-1917. + BRIDGELAND, F Frederick Charles Lionel BRIDGELAND, b. 1882, Orroroo, South Australia, son of George Alfred BRIDGELAND and Fanny Elizabeth HANCEY. Served in the Boer War with the 5th Victorian Mounted Rifles. Enlisted in the AIF on 21 Aug 1915 and served as Tpr 73, 4th Light Horse Regiment, AIF, and was KIA at ANZAC, Turkey on 6 Aug 1915. + BUCKLE, F R Frank Ronald BUCKLE, b. 1895, Merino, Victoria, son of George BUCKLE and Elspeth WHYTE. Pte 2834, 24th Battalion, AIF, enlisted 30-07-1915, KIA Pozieres, France 29-07-1916, Butcher's Assistant. + BUCKLE, R G Reginald George BUCKLE, b. 1891, Merino, Victoria, son of George BUCKLE and Elspeth WHYTE. Pte 1231, 39th Battalion, AIF, enlisted 20-03-1916, DOW Amiens, France 13-07-1918. + BULL, W G William George BULL, b. 1894, Strathdownie, Victoria, son of Samuel BULL and Ann JARRAD. Pte 2336, 24th Battalion, AIF, died of wounds 3 September 1918, Mount St Quentin, France. + BURNIP, A Alfred BURNIP, b. 1880, Hay, NSW, son of Charles BURNIP and Julia Sophia TYERS, brother of Mrs Lily McCALMAN of Sandford, Victoria. Pte 4298, 24th Battalion, AIF, enlisted Melbourne 28-10-15, DOW 24 Apr 1917, Bullecourt, France. + BUSH, W J William James BUSH, b. 1894, Long Gully, Bendigo, Victoria, son of George Arthur BUSH and Elizabeth H GLENN. Pte 31340, 2nd Australian Light Trench Mortar Battery, AIF; Teacher at Casterton Higher Elementary School; enlisted 18-09-1916, DOW 5-05-1918 France, buried Ebblinghem Military Cemetery, France. + CAMPBELL, A Angus CAMPBELL, b. 1894, Framlingham, Victoria, son of Donald CAMPBELL and Margaret STEWART. Pte 1525, 21st Battalion, AIF, enlisted 1-04-1915, KIA Pozieres, France 1-07-1916. + CAMPBELL, D Dugald CAMPBELL (ex Corndale). Dugald CAMPBELL b. 1884 Corndale, son of Neil CAMPBELL and Mary Ann McQUEEN. WW1 Tpr 1449, 4th Light Horse Regiment; Wool Classer, enlisted 2-08-1915, DOD 16-11-1916 at sea. + CASS, J John Edward CASS, b. 1884, Harrow, Victoria, son of Michael CASS and Rose BIRMINGHAM. WW1 Pte 6489, 8th Battalion, AIF, enlisted Chetwynd, DOW 5-10-1917, Broodseinde, Belgium. + CASSIDY, A M Alfred Morris CASSIDY, b. 1896, Apsley or Casterton, son of Edwin CASSIDY and Anne SHAW. Pte 860, 24th Battalion, AIF, enlisted Portland ___, died of sickness (at sea), 29-05-1916. + CLARKE, J John Joseph CLARKE, b. 1888, Chetwynd, Victoria, son of Bernard CLARKE and Catherine FOX. WW1 Pte 2031, 2nd Field Ambulance, AIF, DOW 8-08-1915 at sea, Gallipoli, School Teacher. + CLAYTON, N H Henry Normanby 'Norman' CLAYTON, b. 1891, Casterton, Victoria, son of William John CLAYTON and Hannah SPURRELL. Tpr 281, 8th Light Horse Regiment, AIF, enlisted Casterton 14-09-1914, KIA "The Nek" ANZAC; Electrician. + CURRIE, C C Charles CURRIE, b. 1894 'Warrock' Station, son of Charles John CURRIE and Ellen Jane BILSTON. WW1 Pte 1125, 7th Battalion, AIF, KIA 8-08-1915 Gallipoli; Grocer. + DANCOCKS, G C Gilbert Cunningham DANCOCKS b. 1888, Casterton, son of John Thornton DANCOCKS and Mary Jane Agnes FOSTER. WW1 Pte 118 H Cy Depot, died Broadmeadows Army Camp; Wool Classer, Station Manager. There was a Thomas DAVIS, b. 1897, Merino, Victoria, son of Thomas Henry DAVIS and Amelia WILLIAMS. Served in WW1, Pte 2790, 57th Battalion, AIF, enlisted Melbourne 11 Sep 1916, KIA Belgium 25-09-1917, buried Costtaverne Wood Cemetery, Wytschaete, Belgium. + DERAVIN, Dr F A Dr. Francis Arthur DERAVIN, b. 1876, Mandurang, Bendigo, Victoria, son of Jean Theodore DERAVIN and Louisa SMITH. Capt, Australian Army Medical Corps, AIF, enlisted Casterton ___, DOD England, 8-07-1917; Physician Surgeon. + DEVERAUX, A W Alexander William DEVEREAUX, born 1888, Strathdownie, Victoria, son of Alexander DEVEREAUX and Ann BALL. He enlisted as Pte 1684, 19th Battalion AIF, on 22 May 1915, Liverpool, NSW and embarked overseas on 19 Jun 1915 per "Kanowna" from Sydney, New South Wales. He arrived at Gallipoli in Aug 1915 and was admitted to hospital on 22 Nov 1915. He returned to duty on Gallipoli on 30 Nov 1915 and served until the evacuation and returned to Egypt on 7 Jan 1916. In the next phase of the war he disembarked at Marseilles, France with the 19th Battalion, AIF on 25 Mar 1916 and served in France until he was killed in action on 3 May 1917 at Bullecourt on the Somme, France. + DEWAR, W William DEWAR, b. 1893, Warracknabeal, son of William DEWAR and Evangeline Tabitha MAPLE. Pte 6002, 38th Battalion, AIF, enlisted 10-06-1916, KIA France 27-02-1917. + FERRIER, S H Sutton Henry 'Sid' FERRIER, b. 1877, Carapook, Victoria, son of John FERRIER and Alice HANLON. Cpl 176, 10th Light Horse, enlisted 12-12-1914, WIA Hill 60 ANZAC 29-08-1916, DOW (at sea, nr Portugal); Land owner. Died from wounds received in a trench on Hill 60 at ANZAC with Lt Hugo THROSSELL who was awarded the VC in this action. He was the only Light Horseman to receive a VC in WW1. + FOSTER, J G James Gordon FOSTER, b. 1887, Casterton, son of John FOSTER and Emma HOOK. WW1 Pte 3340, 2nd Aus Pioneers, DOW 4-10-1917, Belgium. + GIBSON, W F Appears to be W F GIBSON, b. 1894, Islington, London, son of Frederick and Laura GIBSON, arrived in Austrlia in 1913. Served as Pte 1949, _________, AIF; died 8 August 1915, ANZAC, Gallipoli. + GREENHAM, C G Charles Augustus "Gus" GREENHAM, b. 1888, Dartmoor, Victoria, son of George GREENHAM and Susannah Alice SPENCER. Charles served in WW1, Pte 58, 14th Battalion, AIF, enlisted 1-10-1914, ANZAC, DOW ANZAC 1-05-1915. + GRIFFITHS, H Harold GRIFFITH, b. 1899, Chetwynd, Victoria, son of John Hamilton GRIFFITH and Elizabeth Martha HUNTER. WW1 Pte 3401, 59th Battalion, AIF, enlisted 31-04-1917, DOW France 9-08-1918. + GRINHAM, C O Clement Oliver GRINHAM, b. 1896, Casterton, Victoria, son of Gerad GRINHAM and Agnes Jane MURPHY of Sandford Road, Casterton. He enrolled at Baghallah School in May 1908 and was aged 19y 4m when he enlisted in the AIF on 27 Sep 1915 after serving for 2 years in the Casterton Light Horse. He embarked from Melbourne on 14 May 1916 with the 4th reinforcements for the 29th Battalion, AIF. He joined the 29th Battalion in France on 25 Nov 1916 and served as Pte 2418, 29th Battalion, AIF, and was KIA in France on 7 Dec 1916 and buried in the Guards' Cemetery Lesboeufs, France. + HAYES, H S Henry Seymour HAYES, b. 1884 South Melbourne, Victoria, son of William Seymour HAYES and Minnie Emma PLOWS. Henry HAYES was a 31 year old "Outfitter" of Henty Street, Casterton, married to Ellen TURNER when he enlisted in the AIF on 6 Jul 1915. He embarked from Melbourne with the 12th reinforcements for the 7th Battalion, AIF on 23 Nov 1915. He was transferred to the 59th Battalion in the Middle East and promoted to Sgt on 4 Mar 1916. He arrived in France on 29 Jul 1916 and killed in the infamous "Battle of Fromelles" in France on 19 Jul 1916. He is commemorated in the V.C. Corner Australian Cemetery, France. + HAYWARD, H James Herbert HAYWARD, b. 1896, Geelong, Victoria, son of James Joseph HAYWARD and Ellen WATTS. Pte 783, Australian Army Depot, Signal School, AIF; Post Office Clerk, died spinal meningitis at Albert Park, Victoria. + HEATH, S V Stanley Vincent HEATH, b. 1889, Tarrayoukyan, Victoria, son of William HEATH and Annie Theresa QUIGLEY. Cpl 1322, 39th Battalion, AIF, enlisted 20-03-1916, KIA Belgium 12-10-1917; Grazier. + HENEHAN, Rev J Rev. John Thomas HENEGHAN, b. May 1880, Doogary, Co Mayo, Ireland, son of Michael HENEGHAN and Margaret GREALY. Enlisted as Pte 3772, 7th Battalion (12th reinforcements), AIF at Melbourne 7-07-1915 ; embarked Melbourne 23-11-1915 per "Ceramic" ; served in France & Belgium as Pte 3772, 14th Field Ambulance, AIF ; wounded France 9-05-1917 ; KIA Belgium as Pte, 14th Field Ambulance, AIF 22-03-1918. R.C. Priest at Casterton in 1915 as well as many other localities in western Victoria from 1908-1915. NOTE: "The Casterton News" of 16th May 1918, reported his death as Captain-Chaplain J. T. Henehan which is not replicated in his AIF file, where he is recorded as Pte 3772, 14th Field Ambulance, AIF. + HOLMES, A L Arthur Leonard HOLMES, b. 1889, Sandford, Victoria, son of George HOLMES and Julia HARMAN. Pte 4059, 29th Battalion, AIF, enlisted 2-08-1916, DOW(Gas) France 13-06-1918; Carpenter. + HOLMES, E Edgar Charles HOLMES, b. 1891, Sandford, Victoria, son of William Tyers HOLMES and Elizabeth Jane BAXTER. L/Cpl 4115, 59th Battalion, AIF, Teacher, enlisted 16 Jul 1915, KIA 17 Jul 1916, Fromelles, France. + HURLEY, D Denis HURLEY, b. 1892, Colac, Victoria, son of Denis HURLEY and Mary Jane MOLONEY. Pte 3869, 46th Battalion, AIF, enlisted 15-07-1915, KIA France 13-08-1916. + HURLEY, J P Jeremiah P HURLEY, b. 1890, Colac, Victoria, son of Denis HURLEY and Mary Jane MOLONEY. Sgt 2392, 46th Battalion, AIF, enlisted 28-05-1915, DOW France 13-07-1918. + HURLEY, T Thomas Joseph HURLEY, b. 1892, Colac, Victoria, son of Denis HURLEY and Mary Jane MOLONEY. Pte 249, 2nd Aust Pioneers, AIF, enlisted 12-12-1914, DOW Belgium 12-10-1917. + JEFFREYS, E Ernest George JEFFREYS, b. 1898, Casterton, Victoria, son of John JEFFREYS and Elizabeth Jane FOSTER. Pte 6134, 8th & 37th Battalion, AIF, enlisted 1-05-1916, KIA Villers-Bretonneux, France, 20-07-1918. + JEWELL, J James Alexander Wells JEWELL, b. 1877, Millicent, South Australia, son of Benjamin Thomas JEWELL and Elvina JESSUP who enrolled at Bahgallah School in 1883 with his father recorded as a labourer of Bahgallah. He enlisted with the New Zealand forces served as Pte 23558, 1st Battalion, Otago Regiment, NZEF and was KIA on 27-09-1916, France. His name is recorded on the Caterpillar Valley (N.Z.) Memorial, Longueval, France as having no known grave. + KELLY, J John Ernest KELLY, b. 1891, Bahagallah (near Casterton), S-W Victoria, son of Michael Patrick KELLY and Julia Elizabeth McEVOY, farmer of Bahgallah, Victoria. He enrolled at Bahgallah School in 1896, son of Michael KELLY, Farmer of Bahgallah. Enlisted in the AIF on 19 Apr 1916, served as L/Cpl 1854, 39th Battalion, AIF, and was KIA ay Broodseinde Ridge, Belgium on 4 Oct 1917. + KING, H H Henry Harold KING, b. 1892, Lake Bolac, Victoria, foster son of Nicholas KING and Mary Jane PATTERSON. Henry KING was a labourer of Casterton when he had his medical examination for the AIF in Casterton on 23 Jul 1915. He enlisted as Pte 11964 and served with the Field Artillery Ammuntion Column, 21st & 2nd Field Artillery Brigades in the Middle East, France & Belgium. He died of wounds on Belgium on 2 Aug 1917 and was buried in the Bedford House Cemetery (nr Ypres), Belgium. His sister Daisy Isabel KING 1894-1970 was married to William "Brownie" SMITH 1888-1967 of Addison-street, Casterton in 1918. + KING, V Vincent Reuben Henry KING, b. 1893, Merino, Victoria, son of John KING and Sarah MUTCH. Pte 2393, 23rd Battalion, AIF, enlisted 24-06-1915 KIA France 22-03-1918. + KIRWAN, A Alexander Eugene KIRWAN, b. 1897, Casterton, Victoria, son of Andrew Valentine KIRWAN and Annie Florence GRANT. WW1 Pte 1727, 58th Battalion, AIF, enlisted Casterton 14-02-1916, KIA Bapaume, France 12-05-1917. + KOHN, S Stanley KOHN, b. 1890, Merino, Victoria, son of Henry KOHN and Elizabeth Ann Mary PEAKE. Pte 66, 24th Battalion, AIF, enlisted 18-03-1915, DOD 28-05-1915, Mediterranean Sea. + LAING, G George LAING, b. 1890, Dimboola, Victoria, son of Joseph Thomas LAING and Euphemia 'Effie' McRAE. Pte 2796, 7th Battalion, AIF, enlisted 30-07-1915, DOD England?, 12-01-1917. + LARKIN, E Appears to be Michael Edward LARKIN, b. 1888, Mitcham, Victoria, son of Michael Edward LARKIN and Catherine Ann McGLONE. Tpr 762, 8th Light Horse Regiment, AIF, enlisted Casterton 1-12-1914, KIA 7-08-1915 Lone Pine ANZAC; Artist. + LEHANE, J Jeremiah LEHANE, b. 1876, Casterton, Victoria, son of Jeremiah LEHANE and Honora O'SULLIVAN. He enrolled at Bahgallah School in Jan 1883 (age 6y) and again in Jan 1892 (age 15y). Jeremiah was aged 38y, a farmer and single when he enlisted in the AIF as Pte 4229, on 6 Aug 1915. He embarked from Melbourne in Dec 1915 with the 13th reinforcements for the 7th Battalion, AIF and joined the Battalion in March, 1916 in Egypt. He served with the Battalion in France and was wounded in June and shipped to hospital in England. He recovered in England and rejoined the 7th Battalion in France in November 1916. Jeremiah was KIA at Flers, France on 22 Dec 1916 and has no known grave. + LEWIS, G George LEWIS, b. 1880, 'Runnymede' Station, Sandford, son of George LEWIS and Mary Ann MURRELL. Pte 5710, 8th Battalion, AIF, enlisted 10-02-1916, KIA France 29-01-1917. + MALLETT, A Albert William MALLETT, b. 1893, Digby, Victoria, son of William Thomas MALLETT and Ida Maria Tremain WHITE. Pte 5050 24th Battalion, AIF, enlisted 7-02-1915, KIA France 3-05-1917. + McALPINE, J John Edward McALPINE, b. 1886, Broomfield, Victoria, son of Robert McALPINE and Matilda Delahunty, BETTS. Lt 94, 21st Battalion, AIF, enlisted 23-03-1915, DOW France 10-06-1918. + McCABE, R Reuben Ernest McCABE, born 1895 Casterton, son of Ellen 'Nellie' McCABE who later married Francis Thomas McCAUSLAND. Pte 1370, 16th Battalion, AIF, enlisted 15-12-1914, DOW ANZAC, Turkey 11-05-1915. + McCOLL, A J Allan John McCOLL, b. 1891, Wickliffe, Victoria, son of Lachlan McCOLL and Christina McLEAN. Pte 534, 39th Battalion, AIF, enlisted 27-03-1916, DOW France 11-09-1918; Farmer. + McCONACHY, S Stuart Laurence McCONACHY, b. 1887 Henty, Victoria, son of William James McCONACHY and Betsy 'Bessie' MILLER. Pte 933, 39th Battalion, AIF, enlisted 10 Apr 1916, killed in action, 28 Jan 1917 Armentiers, France. + McDONALD, J John 'Jack' McDONALD, b. 1890, Strathdownie, Victoria, son of John Samuel McDONALD and Eliza Thompson McDONALD. Pte 1690, 24th Battalion AIF, killed in action 24 August 1916 at Mouquet Farm, France. + McDONALD, R Appears to be Ronald McDONALD, b. ca 1874, Yetminster, Dorset, England, son of Donald McDONALD and Martha Ann ___. Pte 1678, 59th Battalion, AIF, enlisted 9-01-1915, KIA France 19-07-1916, Labourer of Tarrayoukyan. + McDONALD, R T Appears to be Robert Skirving McDONALD, b. 1895, Sandford, Victoria, son of William McDONALD & Mary COX. + McFARLANE, D Andrew Duncan McFARLANE, born 1893 Strathdownie, Victoria, son of Andrew McFARLANE and Hannah DREWETT. He was recorded as a labourer, age 23y 3m when he enlisted in the AIF at Casterton on 21 Apr 1915. He embarked as Pte 2224 with the 6th reinforcements for the 6th Battalion, AIF on the "Wandilla" from Melbourne on 17 Jun 1916. He joined his Battalion on Gallipoli on 6 Aug 1915 and was wounded in a shell explosion the next day and sent to hospital in Cairo. He rejoined his unit on 20 Nov 1915 and returned to Egypt on 7 Jan 1916. He was soon off to France and disembarked at Marseilles on 25 Mar 1916 and was killed in action on 20 Aug 1916 in France. + McGINTY, S P Stephen Percival McGINTY, b. 1896, Casterton, Victoria, son of James McGINTY and Annabella McCALMAN. Tpr 1159, 9th Light Horse Regiment, AIF, enlisted 26-07-1915, WIA Oct 1917, KIA El Arish, Palestine 3-05-1918. + McINTYRE, A J Alexander John McINTYRE, b. 1894, Cobden, Victoria, son of Donald McKay McINTYRE and Catherine Ann FINLAYSON. Pte 518, B Coy, 22nd Battalion, AIF, enlisted 12-03-1915, KIA France 18-08-1918; Miner. + McINTYRE, J James McINTYRE, b. 1884, Bahgallah, Victoria, son of Alexander McINTYRE and Sarah MURPHY who enrolled as a pupil at Bahgallah School ine June 1889 with his father Alexander recorded as a Carrier of Bahgallah. James was a butcher of Casterton when he enlisted in the AIF on 25 Jan 1915 and served as Pte 1929, 16th Battalion, AIF. He was KIA at Hill 60, ANZAC on 29 Aug 1915 and was buried in the Embarkation Pier Cemetery, Gallipoli, Turkey. + McKINNON, J D James Donald 'Jim' McKINNON, b. 1893, Glenburnie, South Australia, son of Lachlan McKINNON and Margaret McMILLAN. Pte 2209, 6th Battalion, AIF, enlisted 21-04-1915, KIA ANZAC 17-08-1915. + McLAUGHLIN, J John Jubilee McLAUGHLIN, b. 1887, Casterton, Victoria, son of John McLAUGHLIN and Annie DOUGLAS. Pte 1888 6th Battalion, AIF, enlisted 6-01-1915, KIA ANZAC 7-08-1915; Labourer. + McPHERSON, A L Albert Lorraine McPHERSON, b. 1883, Casterton, Victoria, son of James Sinclair McPHERSON and Susanna SIM. Pte 2963, 5th Battalion, AIF, enlisted 10-09-1915, KIA Pozieres, France 25-07-1916. + McRAE, C Charles Robert McRAE, b. 1897, Merino, Victoria, son of Norman John McRAE and Catherine EDWARDS. Pte 4153, 59th Battalion, AIF, enlisted 11-11-1915 KIA France 19-07-1916. + MUNRO, D Daniel MUNRO, b. 1882, Rochester, Victoria, son of Daniel MUNRO and Elizabeth FORGE. Pte 2118A, 39th Battalion, AIF, enlisted 22-05-1916, DOW Messines, France 9-07-1917; Farmer. + MUNRO, N C [MM] Norman Clarence MUNRO [MM], born 1897, Sandford, Victoria, son of Daniel MUNRO and Jessie HARWOOD. Pte 3873, D Coy, 24th Battalion, enlisted Wando Vale 30-?-1915, DOW 12-06-1918 France. + MURPHY, J P John Patrick MURPHY, b. 1892, Casterton, Victoria, son of John Michael MURPHY and Jessie Ann ANDERSON. Pte 1360, 39th Battalion, AIF, enlisted 20-05-1916, KIA Belgium 12-10-1917. + NEAVE, R Robert John NEAVE, b. 1884, Tarrayoukyan, Victoria, son of Robert J NEAVE and Catherine McCAHILL. Pte 7283 21st Battalion, AIF, enlisted 25-11-1916, aboard the troopship "Ballarat" when torpedoed, KIA France 5-10-1918; School Teacher. + NEWTON, C Charles Henry NEWTON, b. 1894, Dergholm, near Casterton, son of Henry NEWTON and Mary "Kate" McCOMBE who worked on "Roseneath Station". He was recorded as a Labourer, aged 20y when he enlisted in the AIF on 3 Apr 1916, embarked with reinforcements for the 39th Battalion from Melbourne on 27 May 1916. He arrived in France 4 Feb 1917 and served as Pte 1700, 39th Battalion, AIF, until WIA on 7 Jun 1917 and was then invalided to England. He returned to his Battalion in France on 10 May 1918 and served until KIA on 24 Aug 1918 and was buried in the Bray Vale British Cemetery, Bray-Sur-Somme, France. + OSWALD, T Thomas Francis OSWALD, b. 1887, Casterton, son of Robert James OSWALD and Annie Elizabeth McCORMACK. L/Cpl 3876, 4th Battalion, AIF, killed in action 17 April 1917, Lynecourt Sector, France. Thomas was a Police Constable who enlisted at Glen Innes, NSW. + PAINTER, C Charles PAINTER, b. ca 1891 Cirincester, Gloucestershire, England, son of Joseph PAINTER and ___, arrived in Australia ca 1912. Pte 2422 6th Battalion, AIF, enlisted 2-06-1915, KIA France 1-11-1916. + PEACHEY, J E John Edward PEACHEY, b. 1890, Casterton, son of John Saunders Wyld PEACHEY and Alice GORRY. WW1 Pte 3204, 58th Battalion, AIF, enlisted 25-01-1916, KIA Messines, Belgium 13-03-1918; Groom. + PEARCE, J John Patrick PIERCE, b. 1882, Mt Gambier, South Australia, son of Robert PIERCE and Bridget GEOHEGHAN. Spr 3531A Aust Mining & Boring Co., AIF, enlisted 13-12-1915, DOD France 17-11-1916; Engineer. Attended Casterton State School. + PICKEN, J M John Morris PICKEN, b. 1898, Casterton, Victoria, son of John Francis PICKEN and Emily Elizabeth TUFFNELL. He enrolled at Bahgallah School in 1904. John was a farm labourer when he enlisted in the AIF on 24 May 1915 and served as Pte 4591 with the 14th Battalion, AIF. He was KIA on 18 May 1918 at Amiens, France and buried in the Adelaide Cemetery Villers-Bretonneux, France. + PILVEN, H Hamilton Littleton PILVEN, b. 1871, Portland, Victoria, son of Charles Littleton PILVEN and Marion STEVENSON. Married to Amelia KERR in 1896 and had children born at Edenhope. Pte 3621, 58th Battalion, AIF, enlisted 10-08-1915, KIA France 15-07-1916; Sheep Overseer, Saddler. + PORTER, W E W [MM] William Edgar Walsh PORTER, b. ca 1884, Belfast, Northern Ireland, son of James PORTER and Isabel ___. L/Cpl 1284, 14th Battalion, AIF, enlisted 5-10-1914, awarded MM 21-10-1917, KIA 21-10-1917. + PREECE, H Henry Peter PREECE, b. 1896 Sandford, Victoria, son of James PREECE and Catherine McSHEEHY. Pte 979, 39th Battalion, AIF, enlisted 6 Mar 1915, killed in action, 14 Apr 1917, Armentieres, France. + PREECE, T Thomas Andrew PREECE, b. 1887 Sandford, Victoria, son of James PREECE and Catherine McSHEEHY. Driver 2649, 1st Brigade, Field Artillery, AIF, enlisted 3 Sep 1914, killed in action, 6 Oct 1917, Ypres, Belgium. + RANSOM, T T Thomas Theodore RANSOM, b. 1894, Clifton Hill, Victoria, son of Clarence Theodore RANSOM and Lucy YORK. Served as Pte 1963, 23rd Battalion, AIF, enlisted 28-05-1915, labouer, DOW France 14-04-1916. Thomas RANSOM was b. 1894, Clifton Hill, Vic, son of Clarence Theodore RANSOM 1861-1942 and Lucy YORK 1861-1930. + REED, F W Frederick William REED, b. 1886, ___, son of William Henry REED and Alice ___. L/Cpl 177, 4th Light Horse Regiment, AIF, enlisted Casterton 22-08-1914, RTA 29-01-1916, re-enlisted, 22nd Corps light Horse, KIA Belgium 11-04-1918. Husband of H. M. Reed, of 22, College Avenue, Gillingham, Kent, England. + REID, A B Alexander Bruce REID, born 1888 Mt Gambier, South Australia, son of Thomas Henderson REID and Susan PATON / PATEN of 'Ardno' Strathdownie. Pte 2231, 48th Battalion AIF, enlisted 1 may 1916, died of wounds 4 May 1918 in France, buried Pernois British Cemetery, France. + RICHARDS, G George RICHARDS, b. 1898, Merino, Victoria, son of George James RICHARDS and Elizabeth ELLIOTT of 'Merino Downs'. Pte 5099, 29th Battalion, AIF, enlisted Merino 4-10-1916, WIA Bullecourt, France, DOW 21-12-1918. + ROBERTSON, G Appears to be Gilbert Ivan Clifton ROBERTSON, b. 1895, Edenhope, Victoria, son of Francis 'Frank' ROBERTSON and Charlotte SMITH. Pte 1563, 27th Battalion, AIF, enlisted Mt Gambier 22-03-1915, DOD Egypt 13-07-1915. + ROSSIE, E Eric William Stanley ROSSIE, b. 1897, Hamilton, Victoria, son of William McWilliam ROSSIE and Marjorie GRINHAM. Served as Pte 4118, 29th Battalion, AIF, enlisted 15-08-1915, KIA Belgium 21-10-1917. + RYAN, T Thomas RYAN 1896-1917, b. Casterton, Victoria, son of Thomas Nicholas RYAN and Mary Jane TIERNEY. He enrolled at Bahgallah School in 1908 with his father recorded as a labourer of Bahgallah. He enlisted in the AIF on 5 Jan 1916 and served as Pte 5201, 14th Battalion, AIF. He was wounded and DOW, France, 5 Feb 1917 and was buried in the Bernafay Wood British Cemetery, Montauban, France. + SCHULZE, E A L Eugene Albert Lyttleton SCHULZE, b. 1896, Casterton, Victoria, son of Alfred A SCHULZE and Marion Elizabeth PILVEN. Pte 2991, 29th Battalion, AIF, enlisted 24-01-1916, KIA France 23-03-1917; Chauffer. + SHEARSMITH, E L Ernest Lloyd SHEARSMITH, b. Louth, lincolnshire, England, son of Henry SHEARSMITH and Elizabeth ___. Tpr 913 8th Light Horse Regiment, AIF, enlisted KIA 7-08-1915 'The Nek' ANZAC; Groom. + SIMKIN, J W James William SIMKIN, b. 1894, Digby, Victoria, son of James John SIMKIN and Jane PICKEN. WW1 Pte 6591, 8th Battalion, AIF, enlisted 25-08-1916 DOW 12-02-1917, France. + SMITH, W Walter George SMITH, born 1892 Dartmoor, Victoria, son of John Henry 'Harry' SMITH & Christine LIVINGSTONE. Pte 3131, 9th Light Horse Regiment, AIF, drowned at Gaza, Palestine, 14 June 1917. Walter enlisted at Strathdownie 29 March 1916 and was married to Elsie Margaret McCALLUM in October 1916 at Mt Gambier, SA. + SPENCER, E G Edward 'Ted' George SPENCER, b. 1890, Dartmoor, Victoria, son of Frederick SPENCER and Mary Elizabeth MORRISON. L/Cpl 452, 8th Light Horse Regiment, enlisted 11-11-1914, WIA 'The Nek' ANZAC 7-08-1915, RTA 29-02-1916. Re-enlisted 21-11-1917, Sgt 7579, 8th Battalion, AIF, WIA France, DOW England, 6-06-1918, Theology Student Home Missionary. + SPRING, W A William Argyle SPRING, b. 1895, Moama, NSW, son of William SPRING and Annie MORRISON. William enrolled as a student at Bahgallah School in 1905 with his father recorded as a labourer of Bahgallah. He was a Blacksmith when he enlisted on 28 May 1915 in the AIF and served as Pte 2457, 5th Battalion, AIF. He was wounded and DOW, France, 26 Jul 1916 and was buried in the Warloy-Baillon Communal Cemetery Extension, France. + SPURRELL, F Frederick Alexander SPURRELL, b. 1896, Casterton, Victoria, son of Frederick James SPURRELL and Janet Matilda ROPER. Pte 3942, 23rd Battalion, AIF, enlisted 28-09-1915, DOW France, 6-08-1916. + STANFORD, A J Abraham Joseph STANFORD, b. 1894, Casterton, Victoria, son of Thomas Abraham STANFORD and Mary Jeanne HURLEY. Tpr 750, 8th Light Horse Regiment, enlisted 26-10-1914, KIA 7-8-1915 'The Nek' Gallipoli; Carpenter. His father Thomas Abraham STANFORD served in the Boer War as Pte 307, 5th Western Australian Contingent in 1901. + STEWART, D Dugald Campbell STEWART, b. 1891, Casterton, Victoria, son of James Craig STEWART and Marion / Sarah CAMPBELL. Pte 2331, 6th Battalion, AIF, enlisted 23-11-1914, KIA Cape Helles, Gallipoli 19-06-1915; Carpenter. NOTE: There was a Gideon George TIEMAN, b. 1897, Warrnambool, Victoria, son of George TIEMAN and Catherine NICOL. Lived at Merino. Served in WW1, Pte 7360, 6th A.I.B. H.Q., AIF, enlisted ___, and he RTA on 7 Jul 1919. + TYTHERLEIGH, A John Athelston Corteen TYTHERLEIGH, b. 1898, Middle Park, Victoria, son of Charles Smith TYTHERLEIGH and Margaret Jane CORTEEN. L/Cpl 867, 6th Battalion, AIF, enlisted 18-08-1914, KIA ANZAC 9-07-1915. + VICKERY, W E William Edward VICKERY, b. 1892, Dergholm, near Casterton, Victoria, son of William Reuben VICKERY and Mary Jane LAMONT (McALISTER). He enrolled at Bahgallah Scool in 1906, aged 13y with his father Willian listed as a Trapper of Casterton. William enlisted in the AIF on 10 Sep 1914, served as Pte 1128, 5th Battalion, AIF, and was involved in the ANZAC landing at Gallipoli. He was wounded at Gallipoli in August and transferred to hospital in Malta and then London. He recovered and rejoined his unit in Egypt and was sent to France in 1916 where he was promoted to L/Cpl. William VICKERY was KIA at Pozieres, France on 25 Jul 1916 and is buried in the Pozieres British Cemetery Ovillers-La-Boisselle, France. 1. Albert 'Bert' WALL, b. Violet Town, Victoria, son of John Joseph WALL and Martha Brown WALLACE. Served as Pte 269, 22nd Battalion, AIF, enlisted Dookie, Vic 22-01-1915, KIA 05-08-1916 France. 2. Arthur Geoffrey Nelson WALL, b. ca 1897, UK?, son of Arthur E WALL, Bromley, Kent, formerly of Melbourne, Australia. Served as 2nd Lt, No 7 Training School, Royal Flying Corps, died 6 Aug 1917. + WALSH, J John Thomas WALSH, b. 1879, Digby, Victoria, son of John WALSH and Mary BURNS. Pte, 5th Battalion (20th Reinforcements), AIF enlisted ___, died Glenroy Hospital, Melbourne 29-07-1916. + WELLNER, C Clarence Vale WELLNER, b. 1894, Hotspur, Victoria, son of Mary Margaret WELLNER. Pte 22nd Battalion, C Coy, AIF, enlisted ___, died (measles) Broadmeadows, Vic 14-04-1915. + WHITE, T Andrew Thomas Butler WHITE, b. 1889 'Glenisla' Cavendish, Victoria, son of James WHITE and Margaret BUTLER. Pte 7611, 8th Battalion, AIF, enlisted 18-06-1917, KIA France 11-08-1918.